You don’t have to be an engineer to recreate some of the greatest tanks to ever grace the Earth. 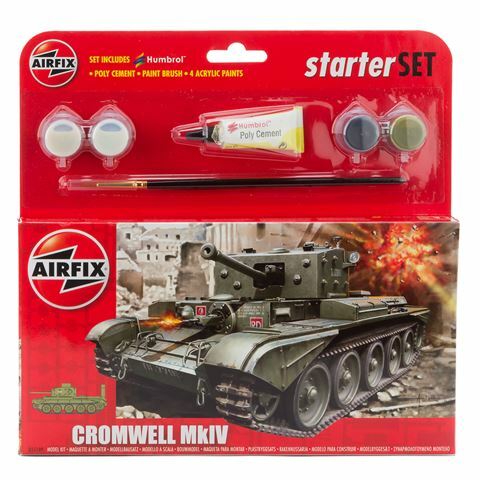 All you need is the MKIV Cromwell Cruiser Model Set by Airfix to construct a little piece of history that fits right on your shelf at home, or in the palm of your hand. These authentic replicas are each made from interlocking plastic parts, which makes them simple for those little hands to construct. Each build-your-own model is presented in a handy box, which contains ninety-one pieces, and everything you need to put the finishing touches on your completed model. The set also comes with four tubs of acrylic paint, a paintbrush and glue, so one you have constructed your model you unleash your inner Picasso and give it a personalised feel. With step-by-step instructions, so that you don’t get lost along the way, you can get your child away from their anti-social gadgets and gizmos, and give them something that will both exercise their little noggins, and entertain them for hours! Recommended for children 8 years and over. Not suitable for children under the age of three. Set Includes 91 plastic parts. 4 x Acrylic Paint Tubs. Model Dimensions: 8.8cm (l) x 3.9cm (w).